Staff photo by Mike Pare / The land holding Edd Kirby's Adventure Mitsubishi in downtown Chattanooga is on the market. The site is seen as possibly a location for new apartments, condominiums, a hotel and retail space. 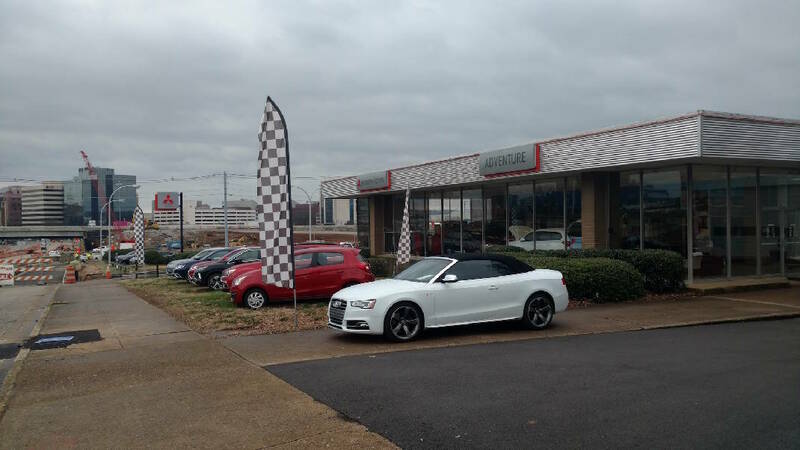 A downtown Chattanooga tract that has held an auto dealership for more than five decades is for sale for $5.85 million. The owner of Edd Kirby's Adventure Mitsubishi says the 4.6-acre site is being offered in two pieces and could potentially hold more housing and retail space as downtown properties rise in value and become more popular for homes and commercial businesses. The Lawrence Doster Lincoln-Mercury dealership opened at the site in 1966 and operated there for many years. Joe Kirby, owner of the car dealership at 400 West M.L. King Boulevard, said the dealership doesn't need a rear section of the property, which is 2 acres and offered for $2.6 million. But, he said, should the whole tract sell for the $5.85 million list price, he'd keep ownership of the dealership and move it to another site. "The property is extremely valuable," Kirby said, adding the land is a prime site for apartments, condominiums, or a hotel. John Healy, of commercial real estate broker Healy & Co., said the piece that fronts M.L. King also could hold retail space and services for downtown residents and workers such as a grocery store or pharmacy. "We've had a lot of interest in the front parcel — people just wanting to buy that," he said. "The challenge is the back parcel." Healy said the tract offers proximity to U.S. 27, adding that it has "a lot of potential" as it's near many of the new residences in the central city. Kirby purchased the Mitsubishi automotive line in Chattanooga from Kelly Auto Group's dealership nearby at Riverfront Parkway and M.L. King in 2015. Later, Kirby also sold the Mazda brand franchise to Tim Short, who relocated that Japanese nameplate to his dealership off Highway 153. Kirby, whose father entered the car business in 1953 along with the late Herb Adcox, opened his M.L. King business on the site of the former Lawrence Doster Lincoln-Mercury dealership in 2010. Lawrence Doster had operated at the site since 1966. Chattanooga's downtown has seen a flurry of new housing, mostly apartments, over the last few years and more is coming on line in 2019. Near the dealership, at the end of West M.L. King, the Cameron Harbor mixed-use development has mushroomed with apartments, townhouses and condominiums put up by Nashville developer Evergreen Real Estate and Chattanooga businessman Eugene "Buck" Schimpf. "It's a matter of supply and demand," said Healy.